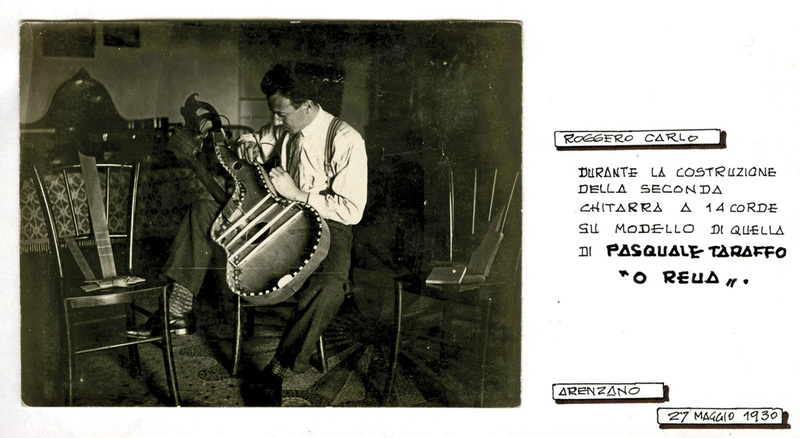 Even before my investigation of Pasquale Taraffo’s career began, one of the very first things I discovered – though I didn’t quite realize it at the time – was an instrument clearly inspired by his famous Settimio Gazzo harp guitar. Even before I learned who Gazzo was, I had seen the first “influenced-by” copy – this unmarked instrument (right) discovered (in Greece, I believe) by London dealer Tony Bingham. With the indispensable and far-reaching investigative help of my esteemed friend Franco Ghisalberti, the amount of discovered Gazzo “copies” has exploded over the past several years. 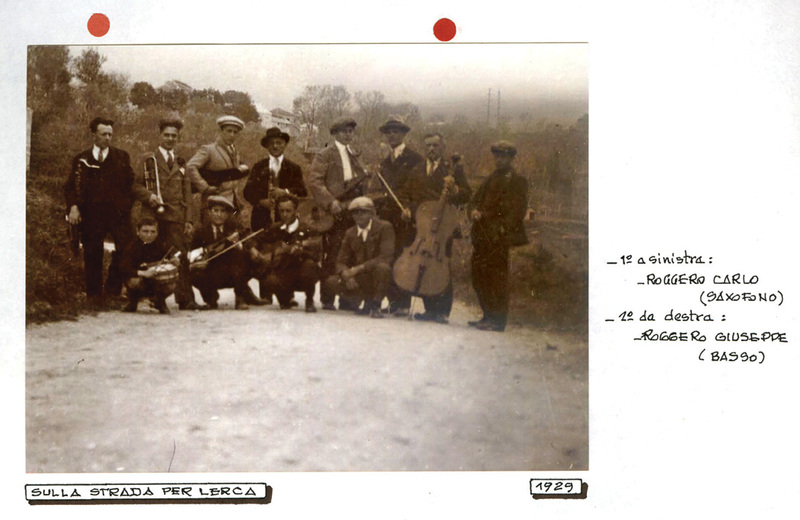 It long ago became obvious that the majority of these Genoese instruments were fueled by their builders’ and players’ adoration for the harp guitar virtuoso Taraffo. Via Franco and other sources, the stories of at least some of these builders and players are being told. Here is yet another recent discovery. Again, the Internet allows unprecedented means for these stories to come forward; I’m just glad Harpguitars.net is there to attract them. 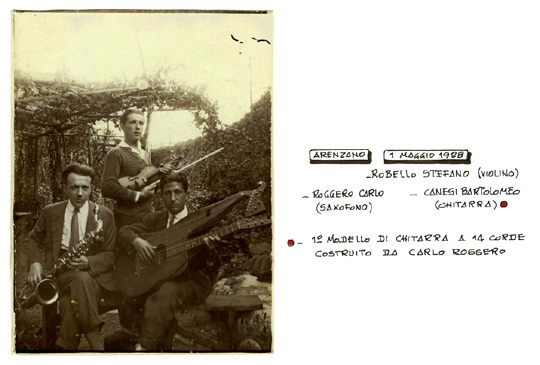 Laura Roggero of Arenzano, Italy (some dozen miles west of Genoa) kindly sent me PDFs of several pages of her priceless family scrapbook. 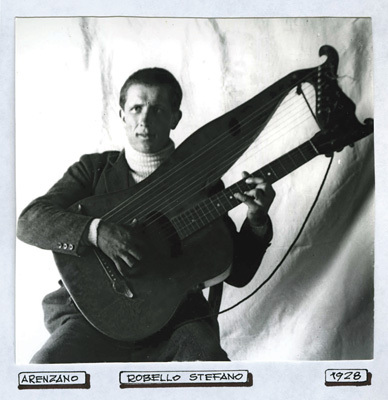 They include numerous photos of two harp guitars her grandfather Carlo built in 1928 and 1930 – not for himself apparently, but for general use by his amateur musician friends. Laura’s father runs a website dedicated to their coastal home town of Arenzano, with numerous self-published books on various topics. 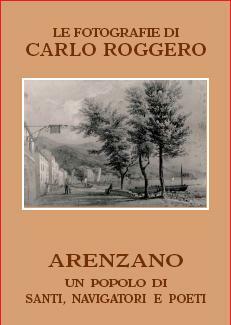 One of these is The Photographs of Carlo Roggero – Arenzano: A Nation of Saints, Sailors and Poets. Here I learned that Carlo (born in 1902) had a long and successful career as a civil engineer. An avid amateur photographer, he used his job as an opportunity to capture the places and peoples of Arenzano, collected in this book by his son Giuseppe (with graphic design by granddaughter Laura). A man with many friends and passions, Carlo seems to have found plenty of time for musical pursuits. Curiously, though his harp guitars were obviously inspired by the region’s beloved Taraffo (a newspaper clipping of Taraffo appears in the scrapbook), Carlo didn’t build them for himself, as he was a saxophone player. 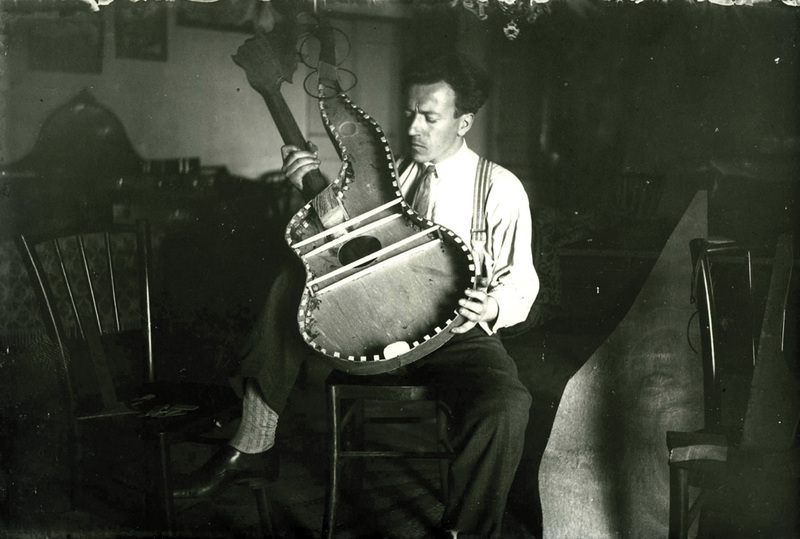 Instead, various friends would play the harp guitar in assorted casual and semi-formal musical groups, which, surprisingly, leaned heavily toward jazz instrumentation. One wonders how easily these guitarists took to his instruments, as they had Taraffo’s full complement of eight sub-basses. 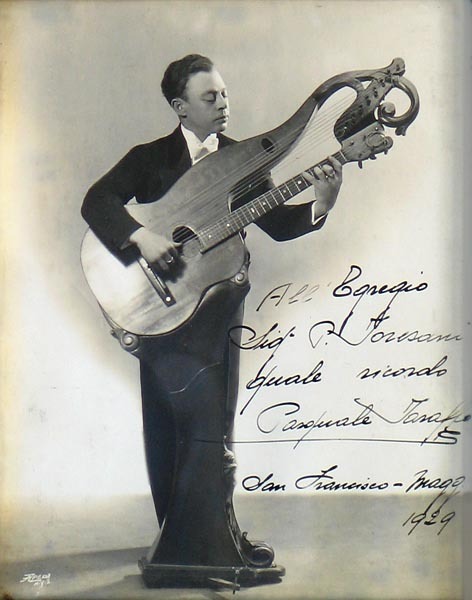 But whether with 3, 4, 6 or more basses, Genoese guitarists seemed to have almost always played harp guitar rather than 6-string guitar – even, it seems, in a jazz context. The popularity of the great virtuoso affected all types of musicians it seems! 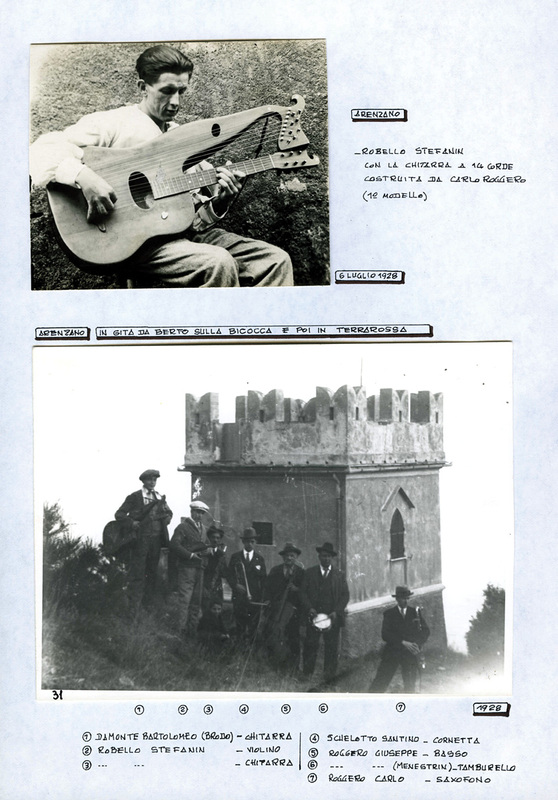 Above: Canesi poses with the instrument. 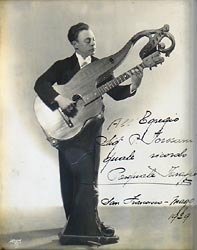 Below (1928-1929): Many other guitarists played Roggero’s harp guitar in various ensembles that increasingly seem more jazz-oriented. Additionally, Carlo’s father Giuseppe played the cello (basso) with his son and friends. 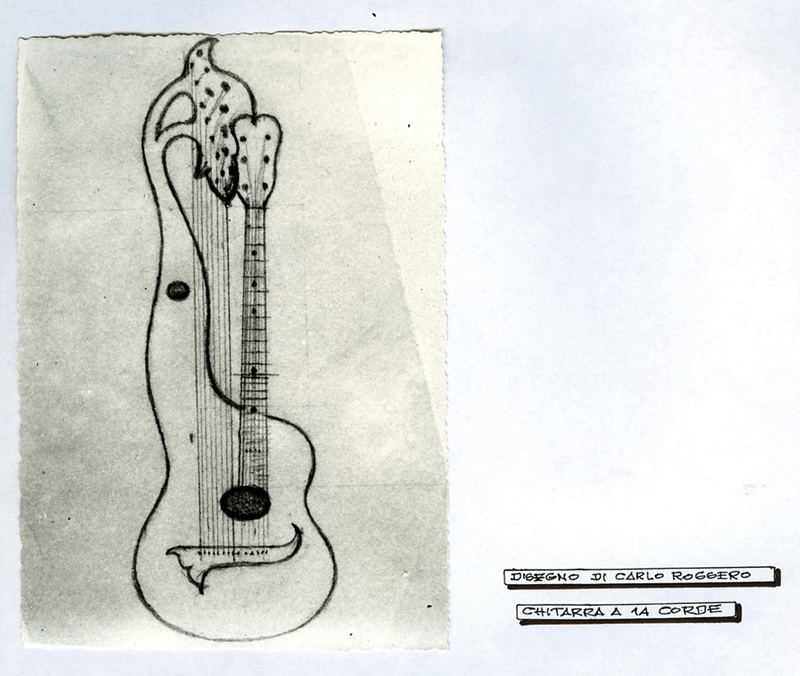 By 1930, Carlo designed a second, fancier harp guitar. 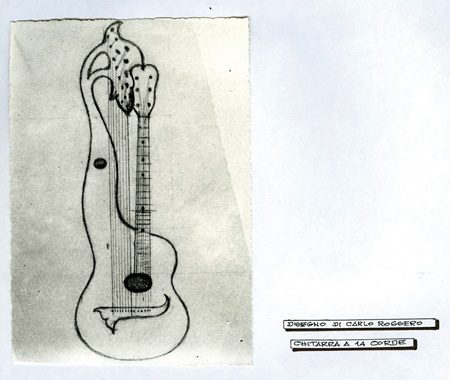 This one was more directly influenced by Taraffo’s ornate Gazzo. 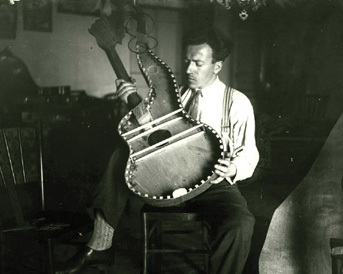 Carlo constructing his second harp guitar in May, 1930. Note his method of installing the two back braces to the side walls in pair with the top braces. The family scrapbook notes “based on the model of Pasquale Taraffo ‘The Wheel’” (Taraffo’s local nickname, inspired by his unique right hand/arm motion). Laura knows of a mandolin and pair of violins still in the family, but no one knows what happened to the homemade harp guitars. 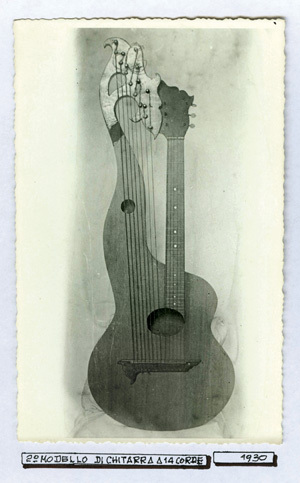 Fortunately for posterity, a perfect photograph of the finished instrument was taken and preserved. 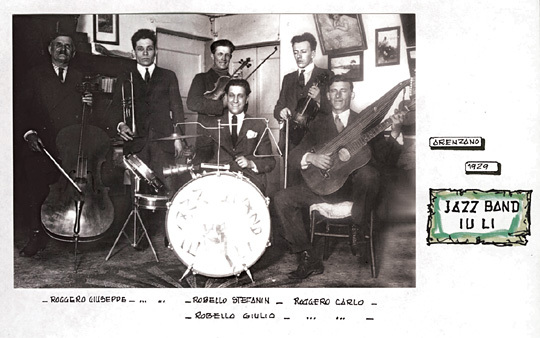 Note the unusual “random” placement of each tuner to its corresponding nut post, dictated by Carlo’s headstock design, and how he appears to have painted the bass head gold as Taraffo later did with his Gazzo’s walnut headstock (at left). 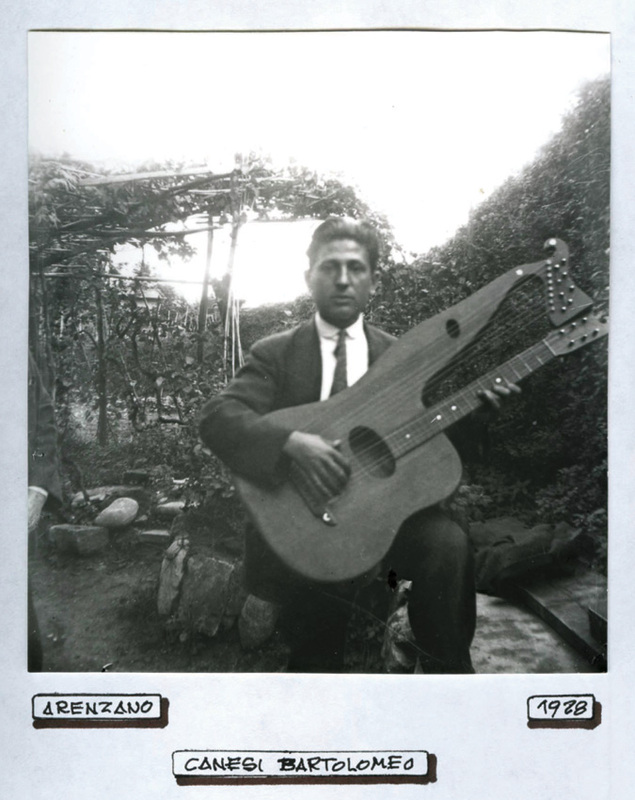 I’ll soon be adding Carlo’s instruments and his harp guitar-playing friends to the growing (and woefully in need of updating) Gazzo study. As saxophonist, camera buff and civil engineer Carlo Roggero paid his own tribute to local legend Pasquale Taraffo, so now does Harpguitars.net pay its respects to Carlo Roggero! Gregg, that is totally cool! Jazz….can you imagine? What fun. It’s so great that you’re putting all this cool stuff up here for us. I tend to only log on when I’m too sick to do anything else, so I miss a lot, but I’m going to get myself a shortcut to the Blog on my desktop, so I can easily check in more often. Grazie per il bellissimo articolo. Quando l’ho letto mi sono commossa! Thanks for the great article … I’m very touched by the words you wrote about my grandfather.